I just came across some slides that I shot three years ago in early April, 2005. They were taken with my Olympus Pen-F half frame camera. I decided not to scan them back then because I was seriously lacking in hard drive capacity. But last week I made nine or so scans and stitched this panoramic together. Pictured above is the east side of Bowery between Houston and First Streets. Toward the right half of the image is Avalon Chrystie Place (with the reflective windows) and the empty lot toward the left, as well as the brick buildings in the middle, show what is to become Avalon Bowery Place. The five-story tenement building in the center is 295 Bowery, which over a hundred years ago was the infamous McGurk's Suicide Hall. According to a 1999 New York Times article, "The building had been a hotel during the Civil War, catering to returning soldiers. By the 1890's it was a brothel and a dive where it is said a half-dozen destitute courtesans drank carbolic acid and died. John H. McGurk, the owner of the saloon on the ground floor, then capitalized on the notoriety of the place by renaming it McGurk's Suicide hall." 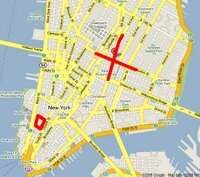 For an in-depth, yet not-too-lengthy primer on what Bowery has become, there's the 2003 article "Palimpsest Street" by Kevin Baker. 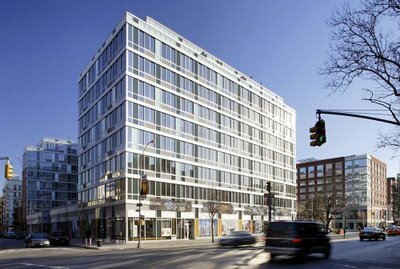 Here's what the same block looks like after construction was completed (taken from the Avalon Bowery Place website): I realize none of this breaking news. 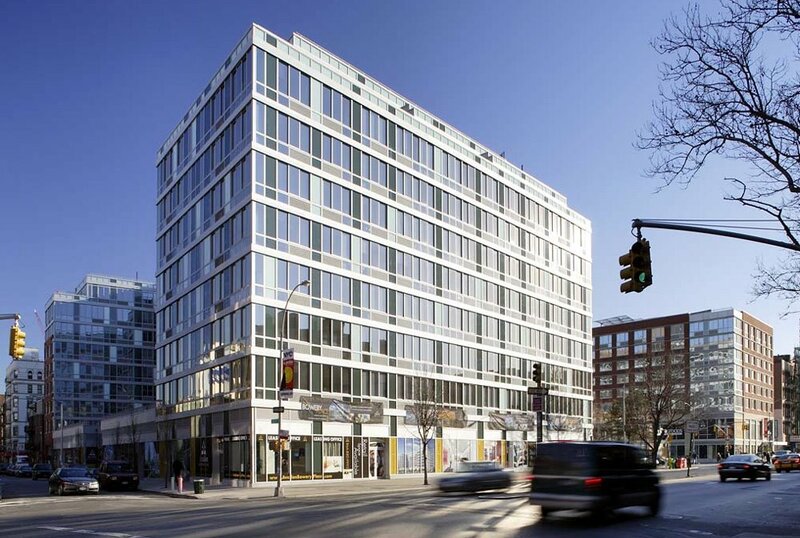 The new Whole Foods Bowery, the New Museum of Contemporary Art, both are old-hat topics. As I said, I just came across these pictures and decided to scan them three years after the fact. As I've been pondering the rebirth of Bowery lately I'm recalling how I got into it with some folks at the bar a couple weeks ago, regarding the progress at Ground Zero. The rebuilding of the World Trade Center is a very touchy topic upon which any two New Yorkers will rarely agree, the rate of the rebuilding, the overall politics, logistics, etc. So many factors coming into play down there. Perhaps it's a bit of an apple-and-oranges comparison, as there's a lot more below-grade infrastructural work going on downtown, transportation hubs, etc. 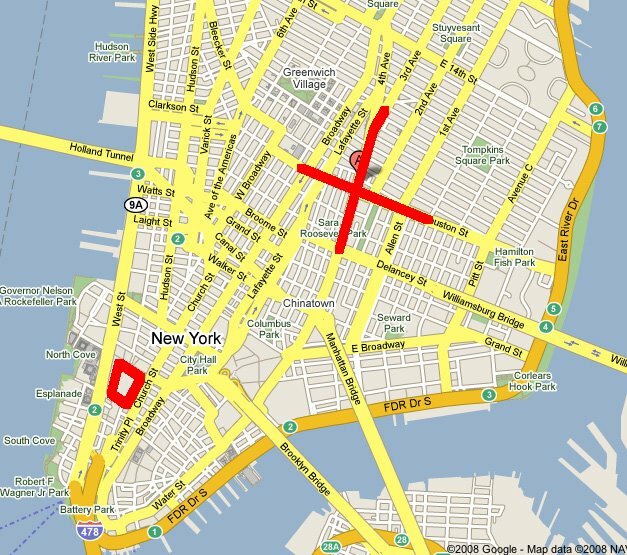 The only reason I even compare the two (Bowery/Houston to Ground Zero) is because it certainly has gotten to the point where the redevelopment of Houston from Broadway to Ludlow as well as that of Bowery from Delancey to St. Mark's Place has far outpaced that of Ground Zero (see map for relative sizes of areas of redevelopment). As we approach our seventh Independence Day since 9/11, ask yourself this: Is it too soon to start wondering why we haven't seen the kind of rampant, white-hot redevelopment downtown within the 16 acres of Ground Zero as we've been seeing everywhere else in the city? Perhaps this fall we'll finally start to see some above-grade skyward-bound progress on the Freedom Tower. (Ground Zero photographed mid-May, 2008). There's an excellent interview with Luc Sante over at the WNYC Street Shoots blog. Here is the direct link to the interview. It was just announced that Sante will be one of the judges for the Street Shots Challenge. There's still one day left to enter, so get to it. My favorite part of the interview is when he's asked why he thinks street photography is so popular. His reply: "New York Street Photography is popular in the same way that Rock and Roll is popular. It's a genre that has so much energy in it that it never quite seems to be exhausted. And people are driven to it by the energy and don't think about whether it's formerly exhausted or not." He goes on to make a great analogy about photographing New York: "Everybody's been photographing the pyramids since the invention of photography just about, and they're going to keep on photographing the pyramids until either photography or the pyramids disappear, whichever comes first." Several years ago I bought a book called "The World Of Henri Cartier-Bresson" at A Photographer's Place on Mercer Street. In it, there's a picture I had never seen before in any other Cartier-Bresson book. The picture (above, right) is from Japan in 1965 and it's got a wonderful, slightly chaotic, multi-directional composition to it. The receipt for my copy of that book is dated February 10, 2001. Less than two weeks before I bought the book, however, I took a picture (above, left) that is eerily similar to his. The reason I know it was taken two weeks before I bought the book is because when I shot my picture, at a flea market on 24th and Sixth Avenue, I had just come from a bookstore nearby where I had bought a different HCB book ("Henri Cartier-Bresson: The Early Work"). And my receipt for that book is dated January 28, 2001. Of course even though this is a huge coincidence, and it wasn't until probably several months later that I registered the similarity, it is a huge nod to Mr. Cartier-Bresson and the undeniable pull his work has had on me. This all comes to mind because of a different-but-somewhat-related thought I had this weekend, walking through Union Square Park, when I came upon a young woman sitting on a bench playing her acoustic guitar and singing. I thought to myself, "What can you really do with just your voice and an acoustic guitar that hasn't been done already?" And then a parallel idea occurred to me: what she was doing with her music is pretty much what I do with my photography. It's not a rule I live by, but I definitely am a big believer in "one camera, one lens" type of photography, just as this woman was performing with "one instrument, one voice." Music and photography is a very easy and often-discussed comparison. But it begs the question, "What is it, exactly, that I think I'm doing with my photography that hasn't been done already?" Is there really anything I will have "achieved" at the end of my career that will have gone beyond merely "experimenting within tradition"? I suppose there's a lot of material out there I could read, and one title in particular comes to mind (and is a phrase I love to use), The Anxiety of Influence. In the end, I suppose we should all just stick to our guns and do what comes naturally, and not, as Cartier-Bresson said, get bogged down by "proving or asserting [our] own originality."